European manufacturer of premium diamond cutting blades – Kožul d.o.o. Committed to a strong industrial strategy, the Klingspor Group has manufacturing at the heart of its DNA and offers a product line consisting almost exclusively of items that it produces in-house. Diamond cutting blades, a product line that accounts for only 3% of its turnover, had a particular position and the question was finally raised of investing in the firm’s own means of production. Thus, three years ago the decision was made to expand in the diamond cutting blade market, and since this date the firm has been looking towards a global market in which it should become one of the major players. As emphasised by Wolf-Dietrich Pflaumbaum, the senior executive responsible for the diamond project at Klingspor, “This is a long term approach that will ultimately make Klingspor one of the big names in diamond cutting blades on a global level “. The manufacturing process involves state of the art production to manufacture high performance cutting blades at competitive prices, with constant concern for the total safety and quality of the finished product; thus all the segments are laser welded. The production process is executed in a work environment that is comfortable for personnel – no waste discharge, air conditioning makes it possible to attain air purity of 99% etc. 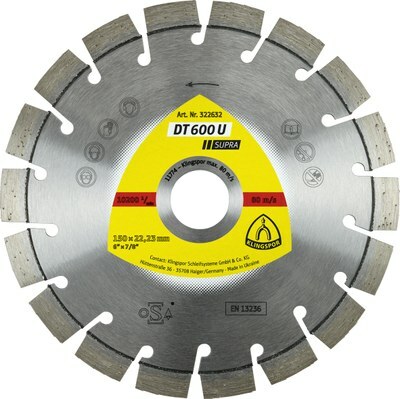 The diamond cutting blades are shipped to Germany twice a week – where a new logistics platform opened in the first half of 2016 – a small portion are directed to Poland and a last portion are reserved for the domestic Ukrainian market. The product line offered by Klingspor extends from 100mm to 500mm diameter with three quality levels which are, in ascending order, the 300 Extra, the 600 Supra, and the 900 Special. The product line is colour coded to suit each material matrix they have been developed for – asphalt (black), tiling (green), refractory bricks (blue), concrete (red) and universal (white) – and it essentially covers the needs, with new development planned for the future. Designed in Klingspor’s R&D laboratory, the different compositions, binder blends and diamonds (coated with titanium or not coated with titanium) and geometries are specific to the brand and enable very high performance. “We want to be superior to other brands, with cutting blades that are optimised for what a customer can expect regarding service life and cutting speed” said Wolf-Dietrich Pflaumbaum. This quest for quality is directly linked to the brand’s determination to establish itself in the international market of premium diamond cutting blades. Thus Klingspor’s approach is to offer only high quality, laser-welded diamond cutting blades at competitive prices. The Velyki Mosty plant has a surface area of 5,760 m² , of which a 1,440 m² hall is for the diamond business. It employs 150 people; one third are involved in the production of the diamond cutting blades – two teams at present with a third team planned for the future. As emphasised by Wolf-Dietrich Pflaumbaum, Klingspor senior executive, “the people are very loyal and interested in our project. They have ideas and this works very well for the enterprise”. The raw materials (diamonds) are stored in a room where access is protected by biometrics (fingerprints). The manufacturing progresses, starting with mixing the diamond with its binding agent to transform it into granules with dimensions, weights and naturally the shapes that are precisely known. In the subsequent phase this knowledge makes it possible to precisely prepare the segments and to effectively calculate the cold pressing that must be applied to mould them in a homogeneous manner – good granulate produces the perfect segment. Blending and granulation are executed in a controlled atmosphere, including strict humidity control; humidity must remain under 50%. Klingspor has two machines for granulate weights up to 20 kg. Klingspor has test equipment that tests the interior and exterior of the diamond cutting blades to determine the performance of their blades and competitor’s blades (speed, wear over x cuts, regeneration of the diamond, etc.). Notably Klingspor has a test area with different surfaces: Steel reinforced concrete 16 mm in diameter, steel reinforced concrete 12 mm in diameter, steel reinforced concrete 6 mm in diameter and asphalt. In the test area a thermal chainsaw mounted on a carriage for cutting asphalt is equipped with a DT 602 A disc 350 mm in diameter, and the same machine used to cut a concrete edge is equipped with a DT 600 U disk 350 mm in diameter. The Velyki Mosty plant also accommodates flap wheel manufacturing, the site’s initial activity since 2010. Some 15,000 flap wheels are manufactured daily, in accordance with a process. In the first step the coated abrasive belts are cut in to pieces and placed in the circular profiles. Then the resin flows to the centre which additionally receives the shaft. The plant also laminates the velour backing on the jumbo (a large roll of coated abrasive product). Klingspor has been setting global standards in abrasive technology for more than 100 years. Our production facilities manufacture more than 50,000 items that fall, among others, into the product categories of – coated abrasives, cutting-off wheels, grinding discs, abrasive mop discs, abrasive mop wheels and diamond tools and that are designed for a wide range of different applications. Spread across the globe, our 36 production and distribution locations employ a total staff of 2,700 and afford us the flexibility we need to satisfy the requirements of each regional market. Our global support and consulting team is comprised of more than 300 field representatives, engineers, and highly trained technicians.